I’m having a kind of bananas spring cleaning week . Fixing stuff that’s been let down for ever. Even my kids started complaining about how messy it is right now- so then you understand how crazy it is for the moment. Look they even started to help out. I guess I should let my hair loose a bit more. I’m finally making a bigger home office as well. My stuff have been falling out of every cupboard. And shelves that have been needing to be hanged is now hung. In the meanwhile Beppe is protecting his most valuable things. And I’ve started to grow some sprouts in a special sprouts jar. I’m not really known for my green fingers but keeping my orchid alive and well blooming I can. I got a tip from my mum- When they have lost their flowers cut the twig at the third knuckle from where the last flower was. Then they grow like crazy. I also just soak them in luke warm water for about 15 minuted every two weeks. 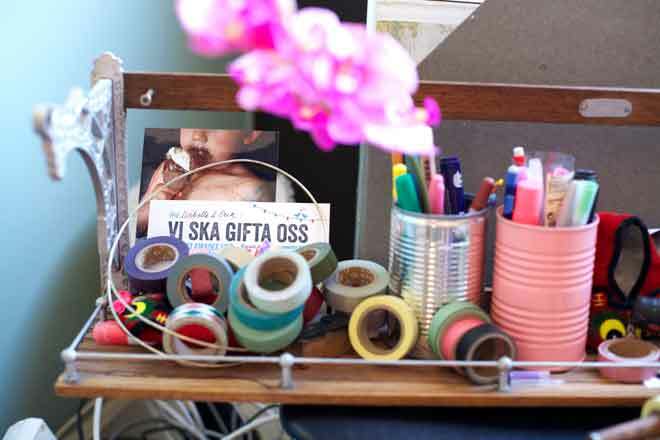 And finally – do you remember this other messy post when I was in awe of the blogger Varpunen and her organized life. Well I got some order even in my cupboards now. Where will this new take on life end?